The NAA-NT (National Autism Association of North Texas) and the ASCC (Autism Society of Collin County) are hosting a Summer Resource Fair for Special Needs families. Read about it here. 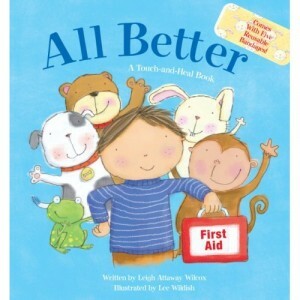 Last night at the fantastic annual fundraiser for Ethan’s school, which boasts a phenomenal Silent Auction, a signed copy of my book All Better: A Touch and Heal Book, was auctioned. After the bidding had closed, my friend (Adrienne’s) daughter (one of Ethan’s classmates) realized that they were out bid by another family. Sweet little Charlie was, according to Adrienne, “heart-broken.” So Adrienne, who was dutifully manning a volunteer station, asked if she could buy a copy from me as soon as possible. Who wants to see a sweet six-year-old suffer? Of course I was happy to oblige and told her we’d coordinate over the weekend to make it happen. A few minutes later I ran into Charlie who was not far away enjoying the event with her dad. She looked at me with the sweetest, saddest puppy-dog eyes I’ve ever seen and said, “Mrs. Wilcox, we didn’t win your book.” I got down on eye level with her (she’s a petite little cutie,) and told her that Adrienne and I already made plans for me to bring her a book over the weekend. Not only did I get a hug, but I got a jump-into-my-arms-and-squeal-with-delight kind of hug! You just can’t beat that. Sweet Charlie sure knows how to make me feel famous! I’ve been basking in the glow ever since. Remember folks, if you’re local (in the DFW area,) I try to keep a small stock on hand to sell so please let me know if you need a copy for your kids, nieces, nephews, friends’ kids, etc. I even have lots of friends buy it to include with new baby or baby shower gifts! 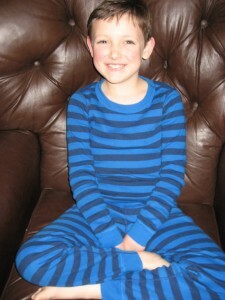 My blog post for the Dallas Moms Blog this week is about Ethan’s first successful sleep-over. Many families living with Autism Spectrum Disorders have to deal with sleep issues and other things which make sleep-overs all but impossible at times. Click here to read more! 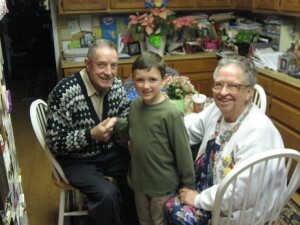 Ethan with Grandma and Grandpa. A new post went live on the Dallas Moms Blog yesterday about a media panel I spoke on last week. Good recommendations from my editor, Nancy Churnin, about making sure our voices in the special needs community are heard, are shared within the post. 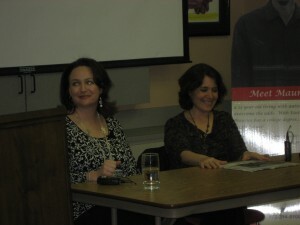 Leigh Attaway Wilcox (left) with Nancy Churnin (right) discussing the media and Autism Awareness. 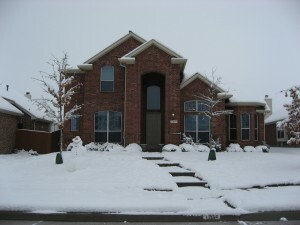 Well, inevitably we get one or two good snow storms here in North Texas every year or so. Yesterday’s snowfall was record breaking, though. Something like 9 inches in one day! 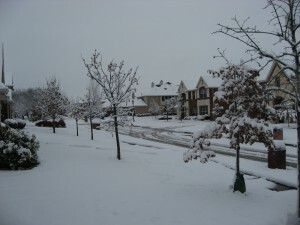 Our quiet street in North Texas! In our school district, kids attended regular classes yesterday because though the flakes were falling and temperatures were chilly, the snow was not causing hazardous road conditions. 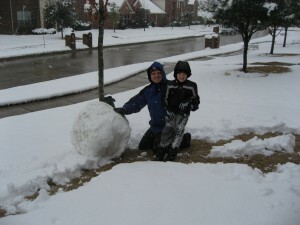 When Ethan got home from school he and Greg started creating some snow art for the front yard. Ethan and Greg with a lovely mid-section for our snowman! Following a snowy drive home from a speaking engagement in Carrollton, I came home to help with final touches. What do you think of our snowcowboy? After dark yesterday the snow kept falling and temperatures dropped making road conditions dangerous, so the kids have a Snow Day today! Needless to say we are taking it easy, had a late breakfast, hanging out in our PJs and making plans to go play in more of the flaky white stuff soon. 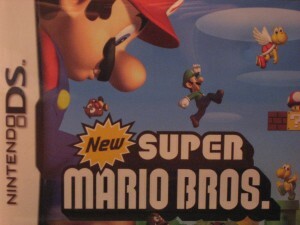 Stop by the Dallas Moms Blog to read my new post about Ethan, Asperger’s Syndrome, Super Mario Bros., Friendship and Unexpected Valentines. Leave a comment to let me know what you think! 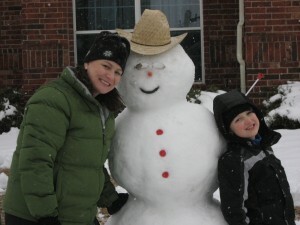 My most recent post for the Dallas Moms Blog went live yesterday afternoon. If you have kids, want to have kids or even simply just care about your own health–I encourage you to read this post. It will change the way you view many things we don’t give much thought to in our daily lives. Ethan has been slowly progressing up through the levels of difficulty in Tae Kwon Do for a year and a half now. 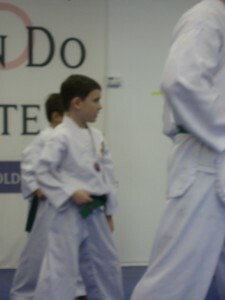 On Saturday, he tested for his purple belt and found success! In order to earn this belt, he not only had to display knowledge and proper use of kicks and punches (alone and in combinations), but he also had to master 3 separate “forms”, spar with a peer and break a wooden board with nothing other than a well-delivered side kick. Since his “breaking” kicks have not been extremely consistent, I have been a slight bit worried for a couple of weeks, but Ethan focused well and kicked right through the board! Hooray for Ethan; another accomplishment forged through hard work!